The coccyx or as it’s commonly known as the tailbone is located at the end of your spine as is made up of 3-5 vertebrae. Although many think that the coccyx is fused, very rarely is this in one block (less than 10%). More commonly it will be separated over 2-3 segments each with an articular disc between them. 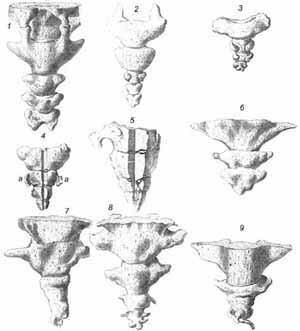 Coccyx also vary massively in size and shape; below are some examples of the variety. Firstly pathology must be ruled out; this is uncommon but is essential! Through evolution we have lost certain muscles and ligaments that were used to control and move our tails. So now we lack the ability to manipulate our coccyx back into the correct position and must be done so by an external force that I shall explain more later. But first, here are common reasons for injuring ones coccyx: falls onto your coccyx, impact sports, winter/extreme sports, horse riding, child birth/pregnancy. A physical examination is usually performed by your practitioner. This can involve both internal and external examination of the coccyx, sacrum and surrounding muscles and ligaments. A local anesthetic can also be used to make sure that it is the coccyx that is causing the pain and is not being referred from another structure, such as the low back. Active x-rays can be performed comparing the seated and standing positions, however, many Dr are not aware of this test and it is rarely used. Orthopaedic specialists will often use local steroid injection into the coccyx or in extreme cases remove the coccyx. As an osteopath, manual therapy has moved to be very effective at easing and relieving coccyx pain. We use both external and (less commonly) internal techniques to take the coccyx back into extension and reverse the affects of any falls that the coccyx has felt. We also work on the surrounding muscles and ligaments to ease the pressure being placed on the coccyx. Some exercises to extend the back through Yoga or through a lumbar extender have been shown to ease the pain. Also suitable coccyx pillows can help to control the tenderness whilst sitting. If you feel like this is affecting you then please feel free to give us a call.